How are you 1/2 year old????? Oh my word we love you more than you will ever know (well until you become a mom ;). You are so happy and smiley and just generally don’t mind all the kisses and touches you receive everyday! 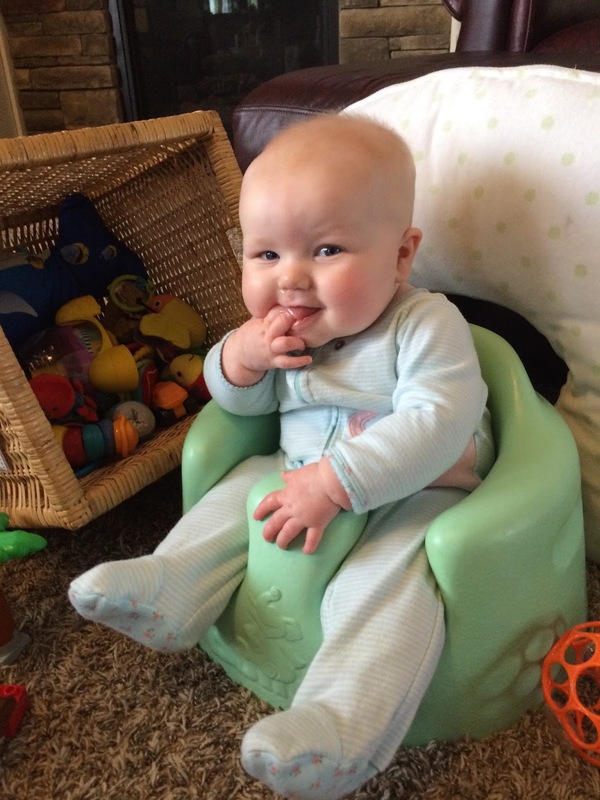 Let’s recap the highlights of month 6, you are growing and changing every.single.day! 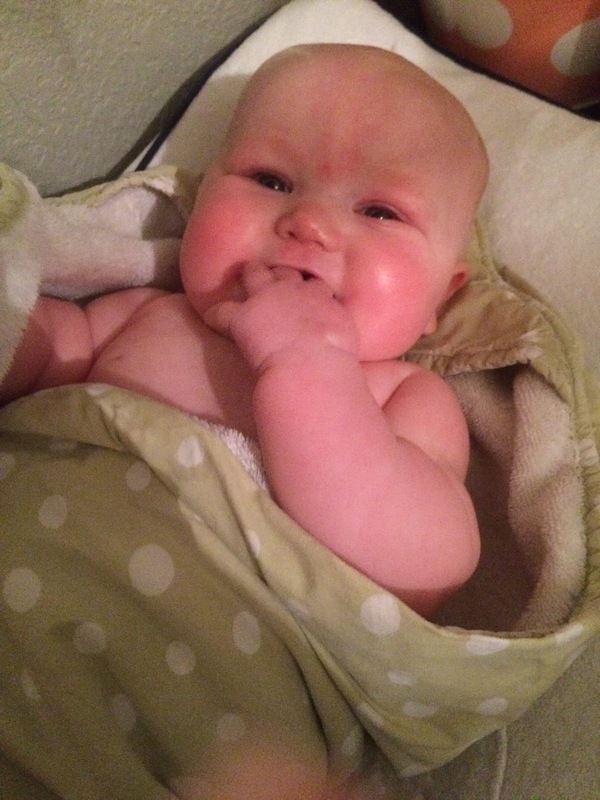 You love bath time…and you love to be naked on your changing table. You only whimper when I put clothes back on you. You love to grab your toes and coo while I change you. You also like a good lotion massage after bath. You splash and smile at us in the mirror while we bathe you on our counter…you did try a bath with V this month but you like the solitude for now :). This sums you up right now, you are putting everything in your mouth. You just need to check your world out and to my surprise you were also teething. 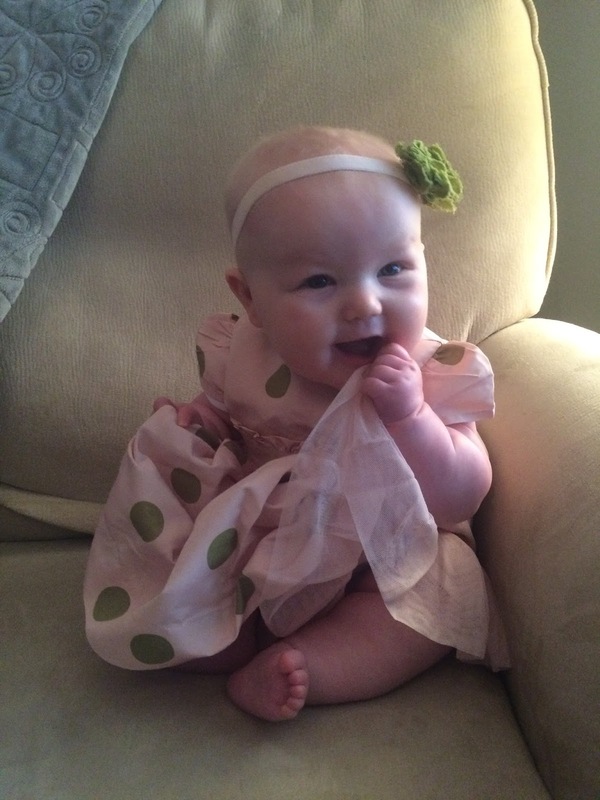 You were chewing on Nana’s hand on your 6 month birthday (12/28/2015) when she felt your first bottom tooth coming in. I nearly fainted from shock. You advanced gal you, your siblings didn’t get theirs until 9 months. Unfortunately you have gotten mom a few times while nursing, we are all hoping that ends quickly :(. We have been letting you practice sitting with a hoppy around you since you are still wobbly or sitting in your gumbo. You like to pull all of your toys out of your basket and watch your siblings. You are starting to enjoy tummy time more and roll over when you want to. You also do a lot of turning like a clock. I will leave you playing and come back to find you rotated around as if you are hands on a clock. My time of you staying put are coming to an end SOON. We took you in thinking you had an ear infection (there was fluid) but we let the cold pass and turns out it was probably those 2 new pesky teeth popping through. Both bottom teeth are in. At your visit you weighed 17 lbs. 15 oz. 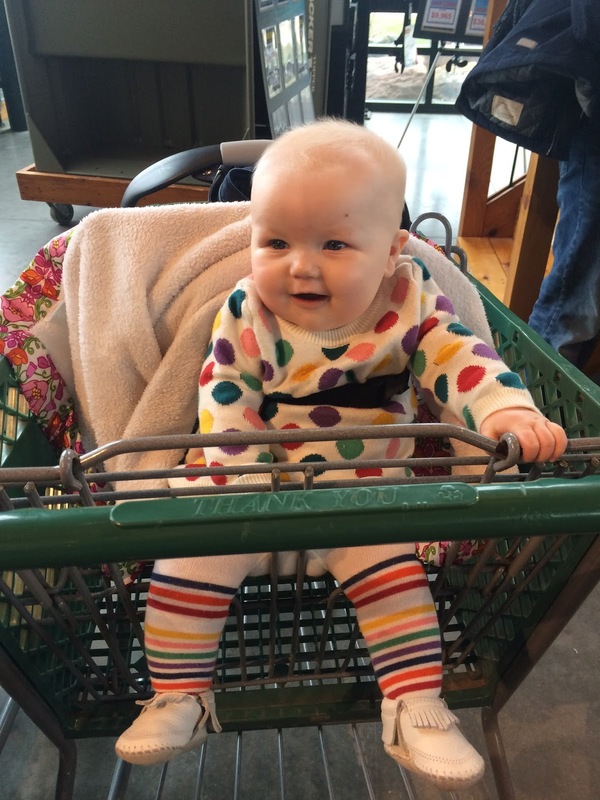 You are wearing mostly 6-12 month clothes and 9 month onesies and pajamas. 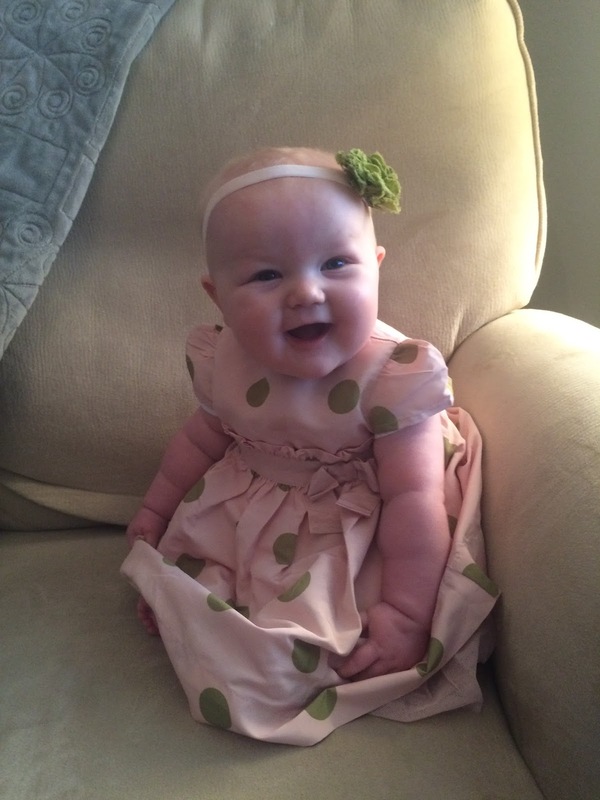 We still squeeze you into some 6 month jammies but your 3-6 month things are just too short! You love to chew on your pacifiers, your fingers, my fingers and everyone else’s hands too — we try to keep hands washed around here so you don’t get another cold (you had one in December). We started you on baby oatmeal on 1/2/16. The first few days you cried when we fed it to you (you still cry when daddy tries to feed you, not sure why) but now you polish off a serving at dinner time. You were sleeping fairly well at night before your schedule went out the window for Christmas. We let you cry it out a few nights when we got home and you are back to going to bed around 7pm and getting up around 4:30-5am some nights and others sleeping until 6:30-7. 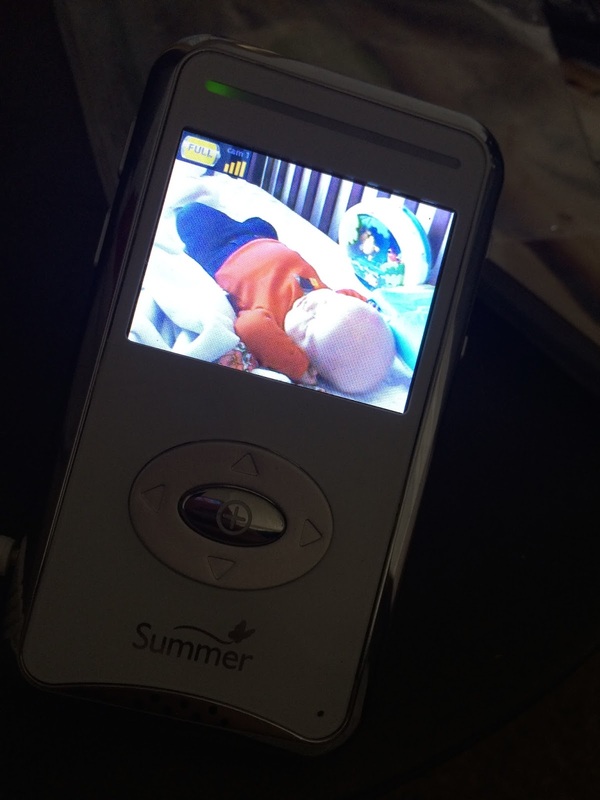 You generally take 2 naps in your crib a day, you take a morning nap (mostly on the go), an afternoon nap and then a shorter nap right before dinner. You LOVE to jump in your jumparoo, you would stay in there forever if I let you. You have a blowout every.single.day and if not one multiple. You wear a onesie to protect your clothes and contain the poop. Some are worse than others but Oxiclean and I are friends. We have tried all diaper types but pampers and Target seem to contain the mess the best but you love to poop in your carseat which generally shoots it right up your back. You still don’t love when mom eats tomato things (like chili) and milk, yogurt and ice cream. Mommy can now do cheeses though – yay! You have become attached to your white blanket, I am trying to also hook you on a lovey that is from the same line in hopes we have options :/. You refuse to take a paci so we are learning ways to soothe you besides nursing because girl you can’t always nurse to soothe, sorry! You remain highly entertained by the chaos going on around you…the kids love to crawl into your crib in the morning and after naps to talk to you. You don’t seem to mind and actually give us all big smiles. You still hold in your laughs but we are finding ways to get you giggling. Solon got you going in the car the other day and we all started laughing as a result…nuts its soooo cute! You still are so flexible with all the trips here there and everywhere — you keep me good company at all the activities. My baby you are growing up and you completed our family. My heart aches a little as the baby in you growing up so fast. I just told your daddy, I would still be carrying you well into your teens and he laughed. Life flies by and it goes too fast but I love watching you blossom into the little lady God bestowed on us to raise. Happy 1/2 year birthday girlie. The next 6 months are going to be filled with lots of exciting milestones, I am so thankful I get to watch them all in the front row! what a difference 6 months makes!